Dubshed takes dual honours even before it opens its doors at the Eikon Exhibition Centre near Lisburn: its the first major show of the year, the season opener if you will; and being the largest car show in Northern Ireland. Of course, this means expectations are high, but several years in GTI NI, the team behind the Dubshed 2017 Car Show, have perfected the recipe. Large, easy access venue, high standard of cars on show, and plenty of variety. To be clear, although it may be a Volkswagen-Audi Group focused event, Dubshed also combines motorsport disciplines such as auto testing and drag racing to entertain the thronged crowd. If you still haven’t visited (and no doubt Dubshed 2018 is being planned already), you need to plan for more than an hour or two to get around this vast event. There’s no doubting the energy and effort expended by car owners to get their pride and joy to Dubshed standards. You can almost sense and feel the tight deadlines and late nights. Under the lights of the Eikon, though, everything is perfection. Paint pops and sparkles, the deep dish polished wheels found on so many cars bounce shafts of light around the hangar-like venue. On Saturday, the spring sunshine streaming in through an open door provided a beautiful backdrop for the pair of Karmann Ghias. The appeal of some cars can be obvious. However, some of the most interesting cars at Dubshed were subtle and stealthy. Popped bonnets revealed clean bays, wire tucks and incredible engineering feats. Engine swaps, power hikes courtesy of forced induction or good old fashioned natural aspiration, enhanced with breathing mods and polished trumpets. The Dubbing scene is ever-evolving, but the Mark 1 and Mark 2 Golf remains a show stalwart. The angular, early era Golfs are timeless classics and still turning heads 30 years on. 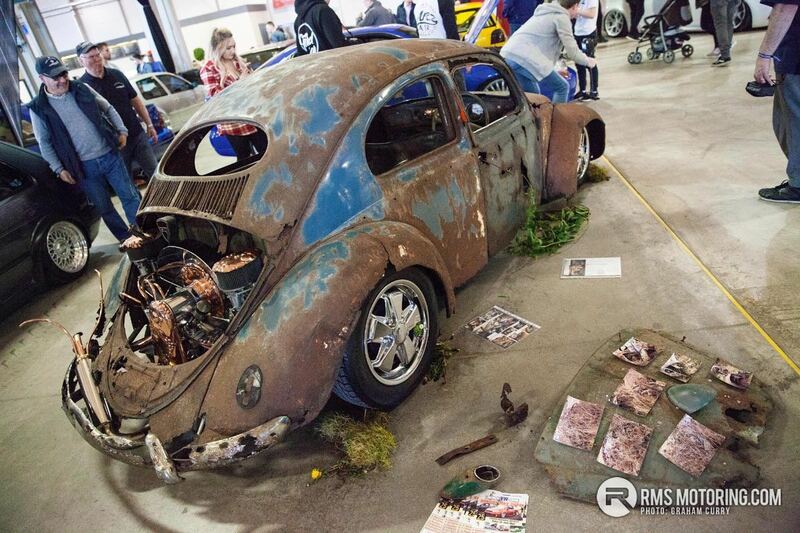 Whilst this incredible rat-rod Beetle also turned heads, but for totally different reasons! With a cursory glance, you could dismiss this car as a total hunk of junk. It’s not until you are up close that you appreciate the detail and effort that has gone into creating the car and perfecting the look. It’s not so much a show car, as a piece of automotive sculpture. It attracts attention, sets tongues into overdrive and is a world of contrasts – the patina exterior against the glowing copper accent parts of the air-cooled engine. Every look revealed another little extra touch that you missed first time round. It has to be seen to be appreciated! Vans, Campers and Caddys were also out in force. These vehicles are far removed from their utilitarian origins. Some of the Caddys were ridiculously clean. It’s hard to imagine that any sort of tools or cargo were ever carried in their truck beds. This Transporter had it all: flawless paint work, prodigious lows and a lush interior with an extensive audio install. This spectacular Jaguar E-Type was tucked neatly into a corner and caused as much of a stir as any of the modified show cars. The 3.8 straight six engined machine was subject to a full restoration in recent years. The luscious curves and wire wheels give the E-Type an incredible presence. The wicker picnic basket and rug in the back just seemed right for the car. Look hard enough and there were plenty of non-Dubs throughout the two halls, breaking up the dominance of German machinery. The VIP styled Toyota Aristo was all kinds of awesome. However, this US-inspired Subaru Impreza was something completely difference again. Impreza ownership can be a little formulaic at times, but this car didn’t follow any established conventions. Chunky overfenders (or arches, if you prefer) housed fat rims and that’s not the sort of blue we are used to seeing. Low is still a lifestyle and if you’re not touching the floor then you’ve got to lose the altitude to increase the attitude at Dubshed. Air-ride and juiced set ups were on display pretty much everywhere across the major displays. There’s no doubting it takes imagination and ingenuity to get that sort of stance. It’s dubious whether or not a Golf, no matter how powerful, needs 8 pot brake calipers from an Audi R8. But does it look good, hanging out behind the spokes of classic OZ wheels? Hell, yes! A few years back I claimed Dubshed was the Best Car Show in Northern Ireland, and sometimes this means the high standards can’t be sustained. Thankfully in the careful hands of the organisers and the unrelenting support of the car enthusiast community here, it has continued to go from strength to strength, cementing its future as not only the best car show here, but a must do for any car enthusiast across the UK and Ireland. In and out in about an hour and a half, usual stuff, some very very nice motors, some we've seen before and a few badly prepped ones. Highlight for me was the red 944, and a couple of the mkiv Golfs for inspiration. I'll probably be back tomorrow for another nosey. Gonna head tomorrow for a nosey. How much is it in? Yes was there myself today as ive my Coupe S inside. Will be back tomorrow alltho il be slightly hungover as out for my father in laws 60th tonight :monkey: Some lovely cars there and what a day for it! | How much is it in? Think £15 but that covered both days. I dunno how people did it in an hour and a half? Maybe expecting too much me thinks? I was there a good 3hrs or more and I didn't see the half of it! Admittedly I had my twin daughters in tow, but even they were enjoying it and didn't mind me spending an age looking at the cars! | Yes was there myself today as ive my Coupe S inside. Will be back tomorrow alltho il be slightly hungover as out for my father in laws 60th tonight :monkey: Some lovely cars there and what a day for it! Is yours the wee silver Polo Coupe S?